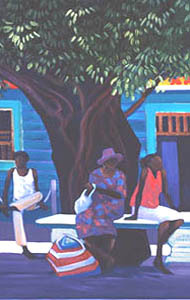 Tropical Paintings Depict Sugar Plantations, Tropical Flowering Trees. 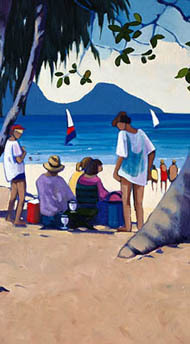 Her romantic tropical paintings of sugar cane plantations, people at Port Douglas markets, views from 'The Hill' with towering blue mountains behind and tropical flowering trees have endeared oil painter, Tania Heben, to the arts community of North Queensland, where she has lived for over twenty years. International and Australian collectors, impressed by her interpretations of this area that she knows and loves, eagerly await her new work. 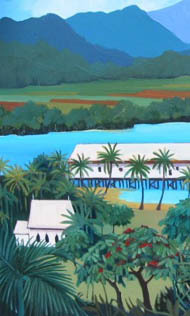 Known for her iconographic representations of life in the tropics, Tania has painted in Fiji as well in North Queensland. 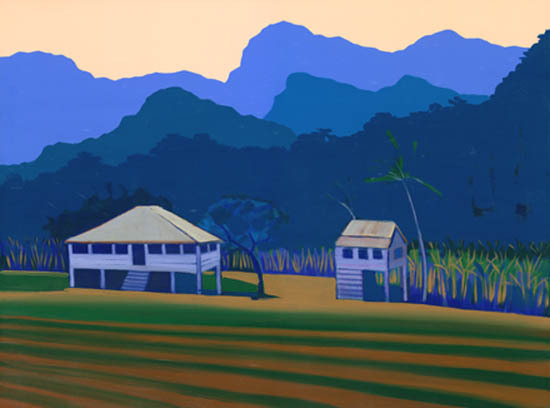 The strong colours and sheer beauty of the tropics, and especially of the Port Douglas area, draw Tania back if ever she is tempted to leave. "This area is home, rich and diverse, with inspiration all around. 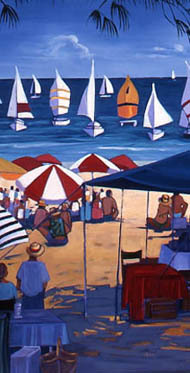 If I lived another lifetime I would never be able to paint it all," she tells me with conviction. Tania's studio is a hive of activity, despite the slow drying time of the oil paints which she uses. 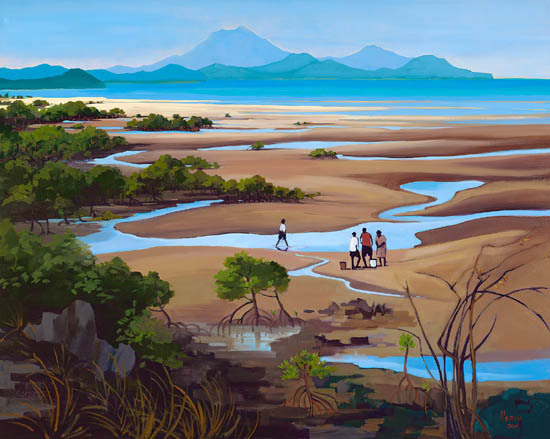 With partly finished canvases stacked to dry, landscape sketches and photographs spread out, Tania works on her latest tropical paintings with energy and inspiration. The process takes over as she applies layer after layer of brilliantly coloured oil paint. First the composition is sketched in with very thin paint, then the 'lean' layers and finally the thick richness of the final touches...and...some weeks or months later...she is done! 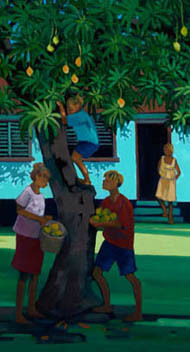 Subjects vary from quaint 'barracks' (living quarters for single men in years gone-by) on sugar cane plantations to children picking ripe mango fruit; flamboyant tropical flowering trees such as the brilliant red poincianas and purple jacarandas to stretches of golden tropical beaches. Many artists avoid accepting commissioned work but Tania enjoys it. She is one of the few artists I know who is happy to accept commissions, which is a huge advantage for collectors. 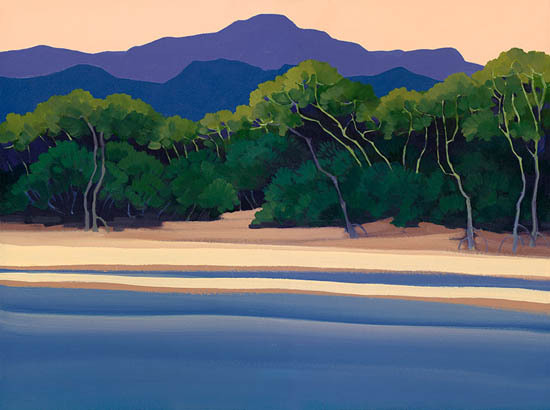 As her fame has spread, although she has a small stock of tropical paintings in her Port Douglas studio, the bulk of her work has become commissions. 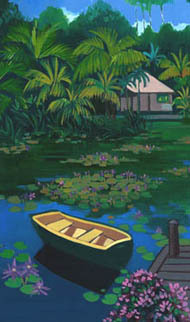 Because the style of Tania's tropical paintings is so distinctive, clients have a good idea of how the finished work will look. All they have to do is to select a general subject - and leave it to the expert! 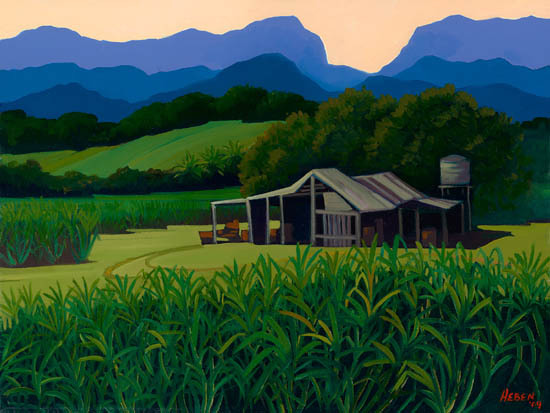 Since the days when Tania exhibited at our gallery, Port Douglas Gallery of Fine Art, prices for her original oil paintings have steadily climbed so that, if you purchased them five or ten years ago, you will now have very attractive investments hanging on your walls! No doubt, you would not wish to part with these tropical pictures, but it is nice to knows that, should your circumstances change, they have more than held their value, in some cases tripling their original purchase price. If you would like to enquire about Tania's current paintings for sale or perhaps to discuss the possibility of arranging a commission please fill in the form below or contact her through her website.